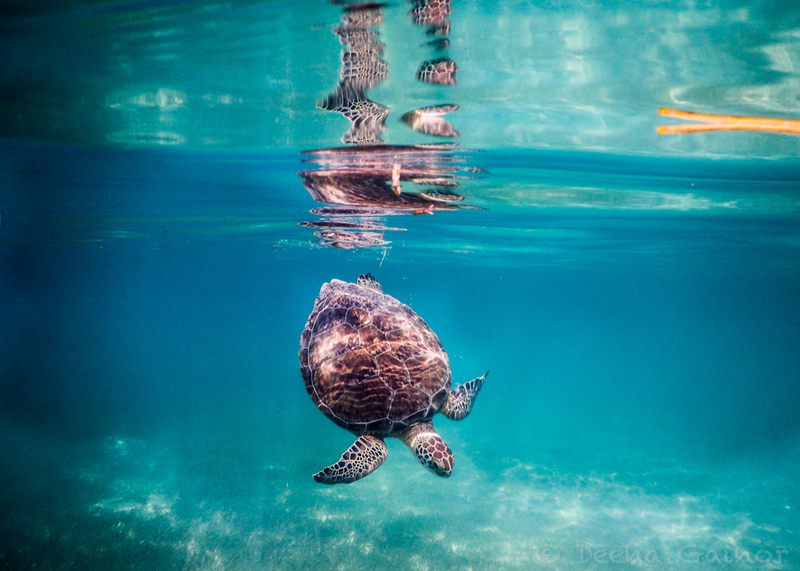 This past Friday, we visited Akumal, famous as a playground for Endangered Green Sea Turtles. We weren’t sure what to expect, and though hopeful about coming face to face with these gentle giants, we tried to remain realistic, understanding that no one can control nature, except God. We got an early start from Playa del Carmen, choosing to have Isidro, our faithful taxi driver of six, transport us there, since we were loaded down with towels, food, a huge, heavy jug of water, and snorkeling equipment. Yes, perhaps we should have taken the Colectivo or the Mayab Bus, which would have saved us a little bit of money, but with six of us needing to pay individually as well as get a separate taxi from home to the Juarez Bus Station, the difference was nominal and so worth the convenience of being transported “door to door.” That said, if you’re a party of two to four and don’t mind walking a little bit, public transportation is definitely the way to go if you want to save money. Visit Tips on Akumal for a little more information. Upon arrival, we were immediately approached by a “member” of the “conservation committee” who proceeded to tell us all of the things we could and couldn’t do. While he may have been sincere (hmmm…still not quite sure about that), it is more likely he wanted to sell us different snorkeling or fishing tours. We politely declined. We quickly set up camp underneath the shade of a few palm trees and donned our snorkeling gear. What can we say? We’ve always loved animals, especially when encountering them in their own habitat. They always remind us of the love and creativity of our Creator. There’s something extremely special about being invited to observe these creatures from up close. It’s like being invited into their homes and sharing their lives, if only for a brief moment in time. We could hardly wait to enter the water. While I would love to say the “donning” went quickly, it took a rather long time, especially since we needed to get the kids used to their new snorkeling equipment. And a few, more than the others, had a challenging time feeling comfortable with their restrictive masks. But…we did not give them a choice. We were doing this! 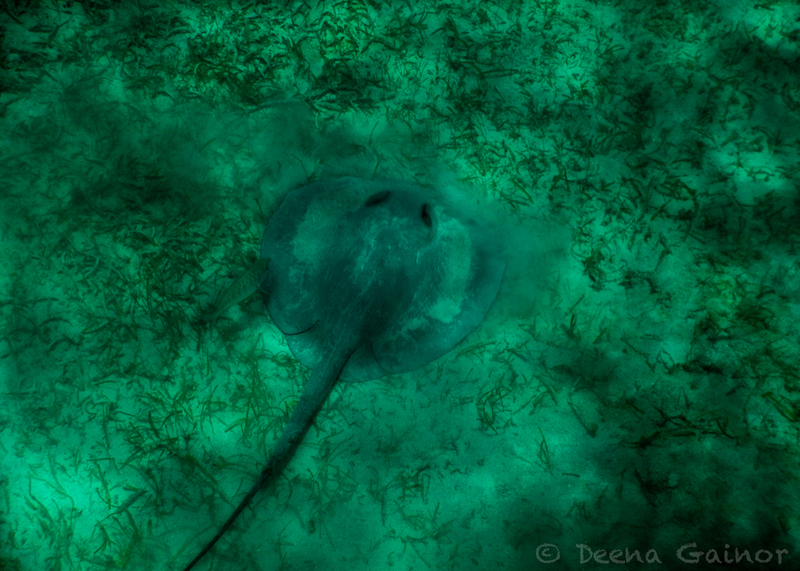 We finally entered the water and almost immediately, we saw a small sting ray. And then a second one! And so the thrills began. We swam out a little further, and within five minutes of being in the water, we were gazing into the eyes of a giant endangered Green Sea Turtle. The sighting didn’t stop there. Throughout the next few hours, we continued to encounter these beautiful creatures. 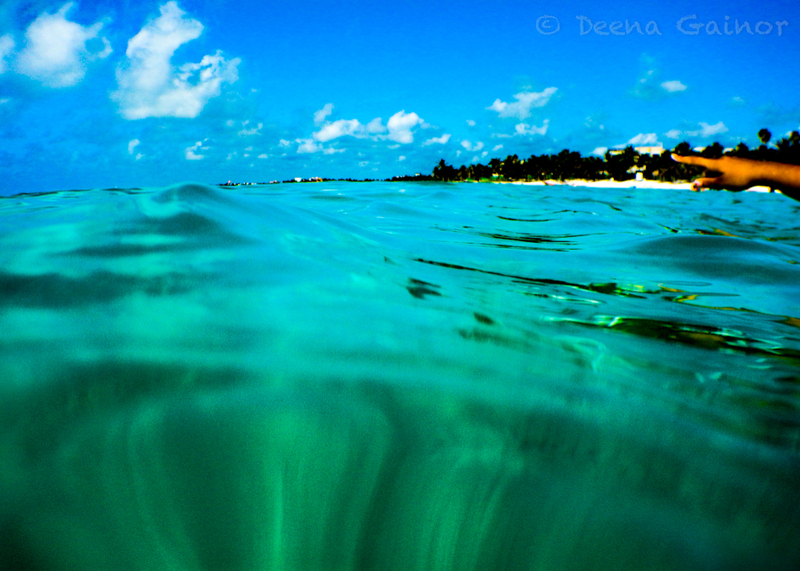 They were calm and tranquil, gracefully swimming through the clear, turquoise waters, grazing on sea grass and algae. Truly, we were blown away! 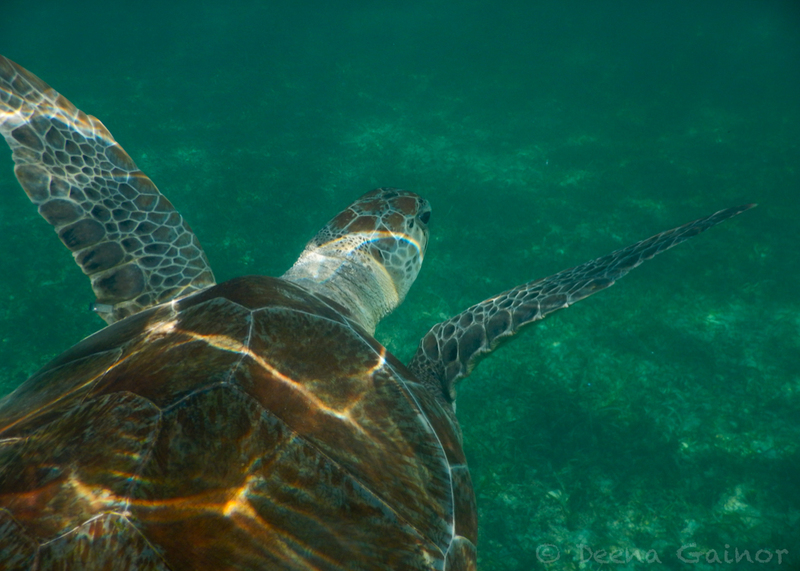 It’s hard to describe what it feels like to be inches away from these gentle yet powerful and very graceful turtles. They are magnificent. Even the timid among us walked away loving this experience and are sure to continue snorkeling now! Just make sure to care for them as you enjoy the pleasure of their company. As the day progressed and the group snorkeling tours increased, we saw many snorkelers shoving their way in too close to the turtles, trying to get that perfect shot. Some even went as far as touching them, which is forbidden and harmful. These actions can truly stress the turtles. So please keep that in mind and enjoy! If you’d like to see a short video clip of what we experienced, feel free to take a peek below! 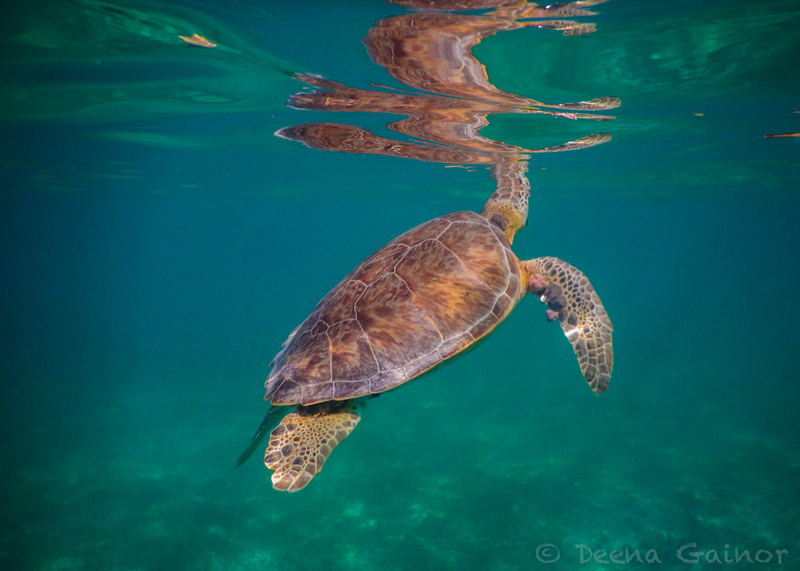 2014 Akumal Endangered Green Sea Turtle from Deena Gainor on Vimeo. What a wonderful experience and something I’ve dreamed of doing for a long time now. It does worry me though how many boats you see at such places, whether it’s reefs, dolphins or turtles, the sheer volume of visitors and boats can damage the environment. On the other hand it can actually work in the environment’s favor. Thanks, Kathryn. We didn’t see many boats at this location, but regardless, people were careless in how they treated the turtles. It was really disconcerting. What’s more worrisome are tentative plans to build a new, very large resort right here. I can’t imagine that would be helpful to the turtles or to the environment. Reblogged this on World Vision.